Back in June I sent the Ksplice guys an email asking when Ubuntu HWE kernels will be supported because I had been running Raring kernels on almost all Precise (LTS) instances I manage. They team was very nice and responsive, I was told support for HWE kernels would be added in the near future (who the heck knows…) and I would get an email notification from the guy when it’s ready, sweet! 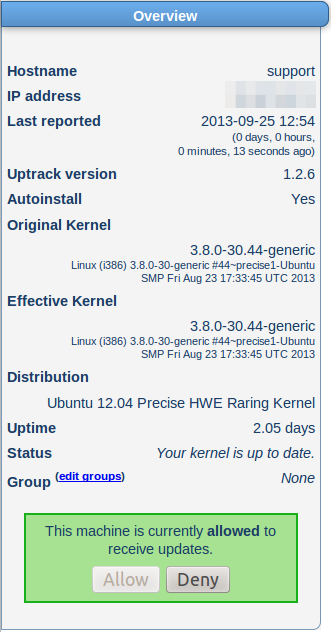 Ksplice officially announced support for Ubuntu 12.04.3 and Raring 13.04 HWE kernel on Precise (12.04) on September 19. It means that you can run the latest release kernel - Raring 3.8.0 (which is based on the 3.8.8 upstream Linux kernel) on Precise with Ksplice support. Kernel patches can be applied to the running kernel without rebooting. This is extremely useful for Ubuntu LTS instances running in the cloud (EC2, Linode, various Xen, KVM VPS providers). Ksplice is NOT capable of upgrading the running Precise GA kernel (3.2.0) to Raring kernel (3.8.0), it is ONLY capable of applying patches on top of the current release kernel. To install latest release kernel, you’ll have to manually install. The easiest method would be installing linux-current-generic package which always points to the the most recently released kernel and headers. Digital Ocean is running KVM but it is a special case, they do NOT allow users to use newly installed kernels. Users have to choose from Settings - Kernel in the control panel. In other words, they will have to enable HWE kernels for Precise before we can use them.